Spending time with other parents and kids through community groups has been wonderful for my son and myself. We get social interaction, a reason to get out of the house, and lots of motherhood advice I likely would not have been exposed to otherwise. With many of our children entering that drooling, miserable stage of teething, we have talked about myriad solutions that trial and error has taught us. I was surprised to hear that the "hip" new tool comes in the form of jewellery. Any potential choking hazard makes me immediately skeptical, but these moms swear by the effectiveness. I had to find out more. 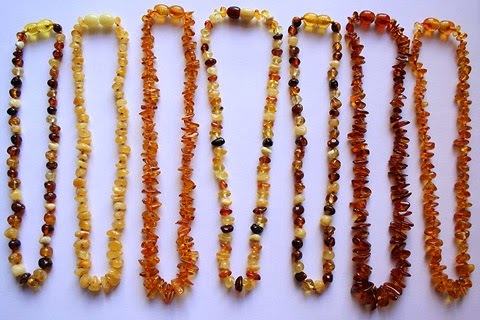 Amber teething products, usually in the form of a necklace or bracelet, are purported to work as "body heat triggers the release of a minute amount of oil that contains succinic acid, a naturally occurring substance in the body. When the oil is absorbed, fans of these beads say it has an analgesic effect on swollen, sore gums." It is also said to be a conductor of safe negative ions that contribute to the body's ability to heal itself and release stress. A bold statement that is powerful enough to have mom's flocking to pick one up. And they appear to be fairly readily available. A quick survey found no less than 3 places to purchase them in my area. They come in various styles and colours so that boys can rock the accessory in a manly way, and products start at under $10. It's a small investment for something claiming to have such outstanding qualities. At various social groups I've had several mothers praise the product. After speaking to many mothers who have tried or are actively using the gems, the results are mixed. Some say it has reduced their child's general whining and drooling considerably. A group facilitator went so far as to say the item is 92% effective when used consistently. One, however, claimed that despite believing in the healing powers of amber and desperately hoping the product would end up being a beneficial addition, found it ineffective for her daughter. On a personal level, I feel skeptical. The idea of constant wear worries me. Having anything in contact with my son's neck during vigorous play and sleep makes me uncomfortable. Of course, there are bracelets and anklets, but the goal is to keep the contact point as close to the ailment as possible, which in this case is near (but never in) your baby's mouth. In addition to the choking hazard, threat of loose beads, and the additional task of constantly hooking and unhooking the necklace for safety reasons, I struggled to find much serious scientific evidence of its effectiveness. Speciality toys that can be chilled, chewed, and cleaned (the 3 C's of teething) are ideal. Things like Sofie the giraffe, mesh chew pouches for frozen grapes, or gel rings for example. These products can be priced as low as a dollar. Frozen breast milk, formula, or cows' milk is a great way to feed and soothe. You can freeze directly on to a pacifier or buy small ice pop moulds for the purpose. Infant gum brushes or even a damp face cloth run over the gums aids in cleaning as well and massaging the gums. Massage, either of the jaw area or even just the soothing contact of mother's touch, is also a major stress reliever and sleep aid during this uncomfortable time. There are classes, instructions, and even YouTube videos to help you learn some techniques. Medication is also available for days when nothing else works - infant Tylenol for the pain and fever or a numbing agent such as infant Orajel or Anbesol. If you feel that your child could benefit from the amber gems, please proceed with caution. Even carefully fitted strings can become detached, have loosened beads, or cause a tourniquet situation. Use your best judgement as to where and when your baby should wear them.